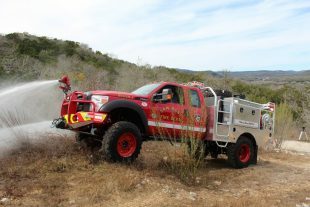 Skeeter Brush Trucks were designed with the collaboration of wildland firefighters and engineers. 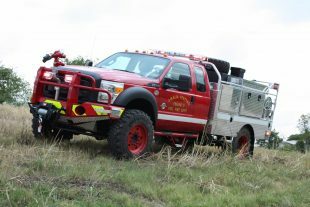 Their solution is a true custom wildland apparatus manufactured to NWCG standards. With an emphasis on protecting the chassis and body through reinforcements and armor, Skeeter Brush Trucks can take the personnel and equipment to the fire and fight offensively while minimizing manpower. Today, Ten-8 Fire Equipment serves customers throughout Florida and Georgia by offering them local sales and service for Skeeter Brush Trucks. At Ten-8 Fire Equipment, we are always looking for ways to expand our offerings and give our customers more options for their needs. The addition of Skeeter Brush Trucks to our line-up does just that. Each body is designed for strength, durability, and flexibility – engineered for 20 years of extreme wildland service. With a TIG welded aluminum substructure (5″ or 8″ structural C-channel main frames with 3″ I-beam cross-members on 12″ centers), strength and durability is never in question with these vehicles. The bodies are then aluminum skinned and spring mounted to the chassis frame. Each body is NFPA flex tested with the customer while flowing water to all discharges to demonstrate and guarantee you’ve purchased one of the highest quality bodies in the industry. At Ten-8 Fire, we want you to be completely satisfied with your purchases, and we are confident Skeeter Brush Trucks will give you that satisfaction! Interested in learning more about Skeeter Brush Trucks? Fill out our online form or call us today at 877-989-7660! Click here to download a brochure on Skeeter Brush Trucks. The Skeeter Flat-Bed brush truck can increase your body options by offering numerous custom body compartments to both the sides and rear. A Skeeter Custom Flat-Bed can easily double your compartment space over a commercial body. Built using high-strength, light-weight aluminum, you won’t have to sacrifice water and equipment for body weight. Additionally, Skeeter’s custom flat-bed body is engineered for severe-duty wildland firefighting with larger frame rails, larger cross members welded closer together, and spring-mounted to the chassis frame, which is rarely offered on any commercial bodies. The Skeeter Step-Side brush truck offers an elevated advantage when attacking fast-moving fires. Secure personnel on each side of the apparatus in a protected firefighting position for better visibility and greater mobility. Skeeter designed a 24″ walkway with access from side-to-side and an NFPA-compliant walkway surface. The step-side cubicles can be equipped with top-mount pump controls, cameras, ground and scene lighting, whip lines or additional storage. The Skeeter Rescue-Side Brush Truck can increase your body compartment storage by up to 50 cubic feet. The Skeeter Rescue-Side maximizes your compartment space by offering two additional vertical compartments and an optional transverse storage is fully customizable for stokes basket, long tools, or cross-lays and slide-outs. Two body compartments are added to the front of the body just behind the headache rack on each side of the apparatus. Each compartment is lined with turtle tile and equipped with a fixed shelf for your convenience. 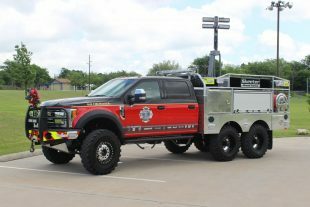 The newest addition to the Skeeter line up is the 6×6 FIREWALKER brush truck, a 2017 Ford F-550 Platinum Edition Rescue-Side. Engineered from the ground up, this vehicle is made for extreme off-road service. A second rear axle and Skeeter All-Terrain Package deliver a wildland unit capable of hauling more water and equipment on a smaller chassis. The 6×6 FIREWALKER increases your body options, offering numerous custom body compartments to both the sides and rear, as well as increasing water tank size to 600 gallons. The 138″ body is beefed up with 6″ mainframes and a multi-point spring-mounted system, engineered for severe duty wildland firefighting. Here at Ten-8, our sales representatives are apparatus experts and problem solvers. Lean on our expertise, and our established partnership with Skeeter to help you design your next brush truck. Contact us today to get started.